PHOTO COURTESY WESTBANK PROJECTS CORP. 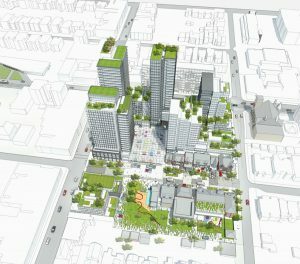 It all came down to this: one final community meeting about Westbank Projects Corp.’s application to build a large mixed-use development on the former site of Honest Ed’s and Mirvish Village. After a long and unprecedented involvement from the community — including residents and local business owners — Joe Cressy (Ward 20, Trinity-Spadina) and Mike Layton (Ward 19, Trinity-Spadina) hosted a meeting on March 2 to present the latest (and perhaps last) iteration of the application. It was standing-room-only in the Bickford Centre cafeteria. The proposed development has undergone many changes since it was first presented in 2015. 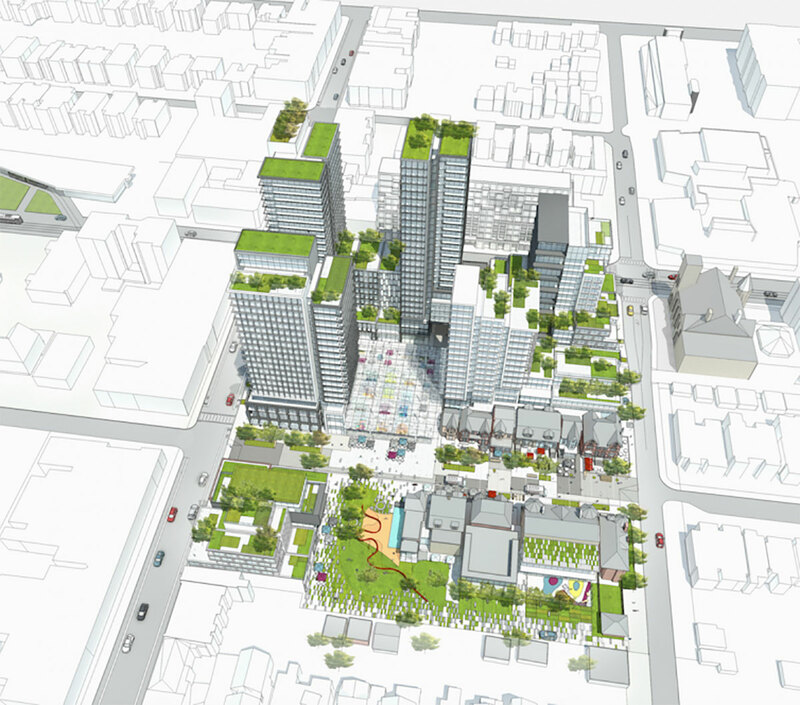 The mixed-use plan includes a total of 804 rental residential spaces, a park spanning 1,150 square metres, a market alleyway, and 15,000 square metres of non-residential space. Twenty-three heritage buildings (up from 15) will be preserved out of a possible 27. All told, 47 unique buildings, including a 28-storey tower, will be raised. Cressy said he was to have a developer who did not shy away from confronting and keeping open communications with the public. “Do we like absolutely everything that’s here? Is it perfect? Not yet,” said Cressy. “But, my goodness I can’t tell you in Ward 20 how many times we have a developer come in and a couple of months later they are at the Ontario Municipal Board. These priorities dictated the flow of the meeting and feedback from those given the microphone to speak. While reassurances came from Cressy and Layton, there were still a number of those who called for the towers to be lowered and the density to be lessened. There were also those who were concerned about recognizing and protecting the cultural history of the neighbourhood. Gus Sinclair, chair of the Harbord Village Residents’ Association, said that while his organization supports the plan, his concerns are whether or not the promise for fully rental and affordable will be kept. Westbank, however, said they were committed to the rental model. Henriquez valued the input on the project thus far and acknowledged that the development has “been strengthened” by residents and city staff. Graig Uens said the city’s concerns with the proposal have been remedied, and that a recommendation to approve the application will be forthcoming.